Prototype: French State Railways (SNCF) class CC 40100 express locomotive. Four-system locomotive for all of France, the Benelux, and Germany. Road number CC 40109. Used in international TEE service. Motive power for the TEE L’Etoile du Nord Amsterdam - Paris. INOX cars (constructed of stainless steel) for the TEE L’Etoile du Nord. A Belgian State Railways (SNCB/NMBS) type A8tu open seating car. A type A8u (SNCF) compartment car, a type A5rtu (SNCF) dining car with a galley, and a type A2Dx (SNCF) generator car with a service compartment. All of the cars are 1st class. The cars look as they did around 1974. Model: The locomotive has an mfx digital decoder and extensive sound functions. It also has a controlled high-efficiency propulsion with a flywheel, centrally mounted. 4 axles powered through cardan shafts. Traction tires. The triple headlights and dual red marker lights change over with the direction of travel, will work in conventional operation, and can be controlled digitally. Warm white and red LEDs are used for lighting. The locomotive has separately applied metal grab irons. It also has separately applied steps. The locomotive has detailed roof equipment and different pantographs. The engineer's cabs have interior details including a figure of a locomotive engineer at the front. Accessory parts are included for installation on the buffer beams. Length over the buffers approximately 25.3 cm / 9-15/16". The cars are reproduced to scale without compromise in any of the dimensions. Minimum radius for operation is 360 mm / 14-3/16" (with sufficient clearance). The cars have underbodies specific to the various types of cars. The cars have type Y24 trucks. The cars have a special paint finish to represent the INOX surface. The 7319 current-conducting coupling or the 72020/72021 current-conducting coupler, the 73405 pickup shoe, and the 73400/73401 (2 per car) lighting kit can be installed in the cars. Total length over the buffers approximately 138.3 cm / 54-7/16". 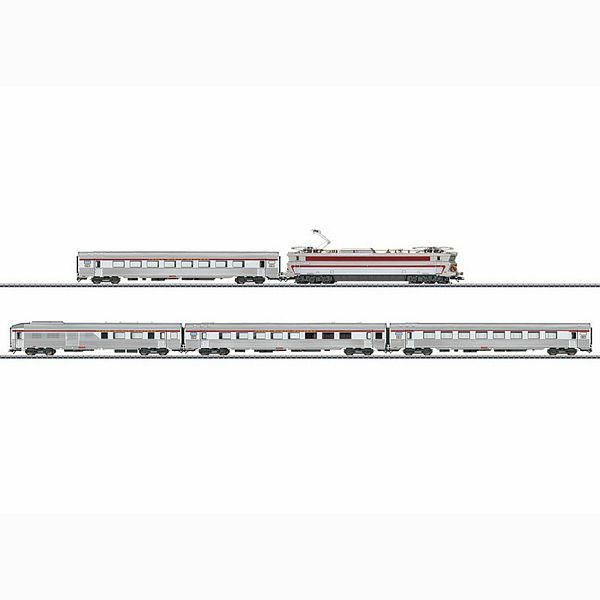 A passenger car set with 3 cars to go with this train is being offered in the Marklin H0 assortment under item number 41879.